What I found was that while they have thrown what must have been a fairly large amount of money into acquiring new dinosaur models they apparently didn’t put much money or thought into their presentation. Nor did they put much more effort into researching their material than what might be required to bring up a couple bottom-feeder creationist web sites on a computer and clicking “print”. 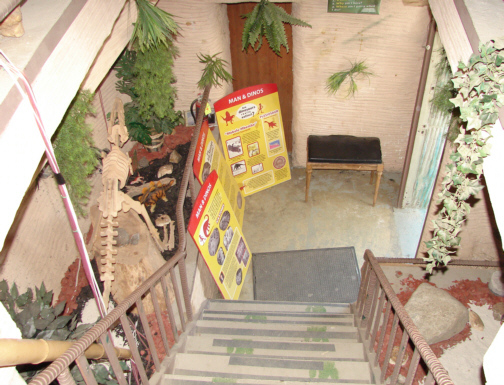 Entrance to the new exhibit overlooked by a smallish Brachiosaurus model (“smallish” only because Brachiosaurs were amongst the larges of all dinosaurs). The price of admission was $6.95, and while I was loathed to pay these intellectual vandals anything, I figure that I might do more good with my reporting on the situation than the evil of paying them a few dollars (similar to the rationalization I have for buying creationist books, that is when I can’t get them used). Kathy on the other hand felt differently and despite the heat chose to go wait for me in the car. First I will walk you through the style of the attraction, looking at some of the models they have and how they are presented and then we’ll look at the substance—what little there was to see. 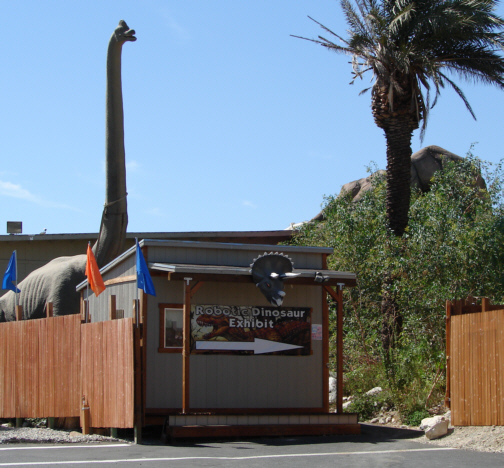 I bypassed the “museum” slash gift shop just past the ticket window and started on the self guided walk through dino-land. 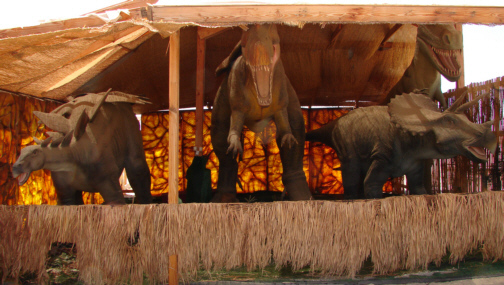 The first dinosaurs were large, slightly animated, and grouped together under a tent-like affair next to the gift shop. 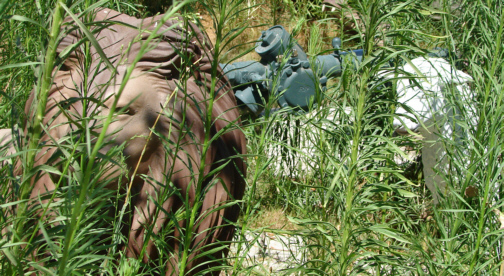 Here, as elsewhere in the attraction, there is little in the way of information on the animals represented in the display. 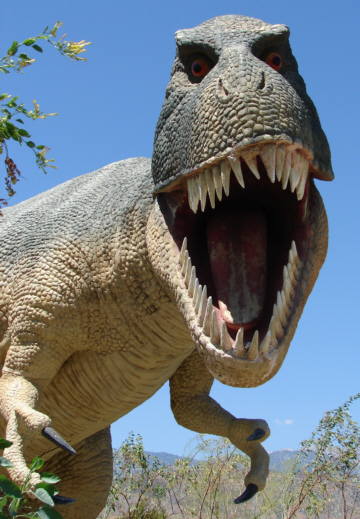 All they had was a handful of paper signs with a short paragraph on each dinosaur. A Stegosaurus, Spinosaurus (minus its sail) and a Triceratops. 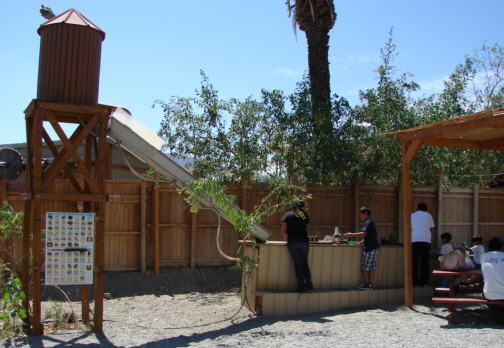 Across from this was a pick-nick area with an adjacent “gold panning” simulation sort of thing with lots of wet gravel for the kids to play with and a handy mineral chart. After this you enter the path through the dinosaurs that begins with perhaps the most impressive of all the models in the new addition, a full sized Tyrannosaurus, which stares menacingly down on visitors as they walk by. I can imagine that it could be a little frightening for some small children. Beside this impressive model was a more diminutive (8′-10′ tall) and dated one (note the tail dragging). 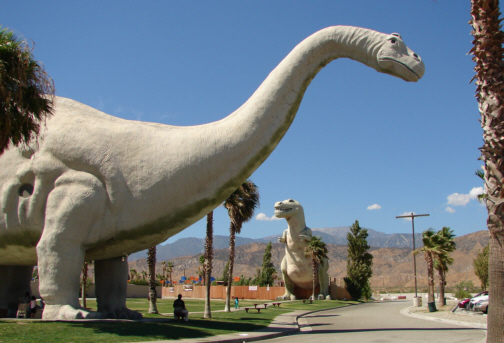 It is also of a Tyrannosaurus and looks very similar to a famous life-sized T-rex model that the Sinclair Oil Company erected at the New York World’s Fair in (1964-1965). The owners seem to have gotten some sort of bulk deal on several of the dinosaur models, as I believe I counted three or four of this particular one painted in slightly different ways scattered around the attraction. Note also the turtle and crocodile models in the above picture. Variations on these were distributed throughout the grounds along with giant frog models and a few quite realistic Komodo dragon models. 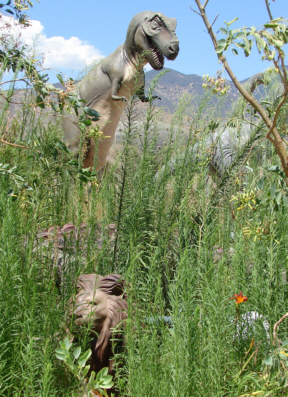 Above is another of the smaller Tyrannosaurus models but note the figures hidden in the weeds at the bottom of the picture. Here we have two inaccurately large (Jurassic Park style) Velociraptors and a lioness. And here some sort of theropod dinosaur with a male lion. 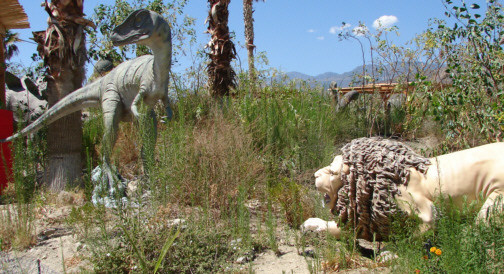 Beyond this not so subtle suggestion that lions, lambs (and people which we’ll get to later) lived with dinosaurs there was little discernible rhyme or reason to the placement of the models on the grounds. They seemed to have just plopped them down and regular intervals along the pathway with the occasional hidden speaker playing bird sounds on a continuous loop. At the end of the trail cul-de-sac, just before you get to Rex, there was a shack with a collection of toy dinosaurs, rocks and fossils just sort of dumped on shelves with some generic information alternating with creationist propaganda. 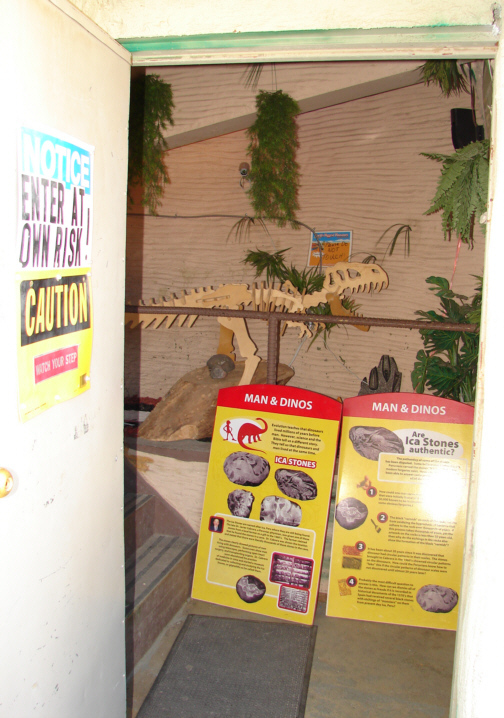 Just past the fossil shack was the entrance to Rex and we’ll spend a little more time here as it is part of the original attraction created by Claude Bell (1897-1988), and this was actually the first time I had ever been inside Rex myself. The interior of Rex is dominated by several flights of stairs leading up to his head. 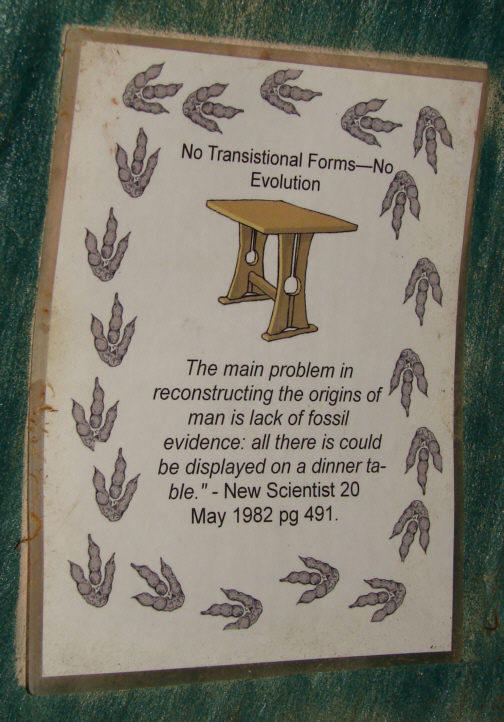 Peppered randomly around the inside were 8 ½ x 11 sheets of paper with miscellaneous bits of creationist propaganda. 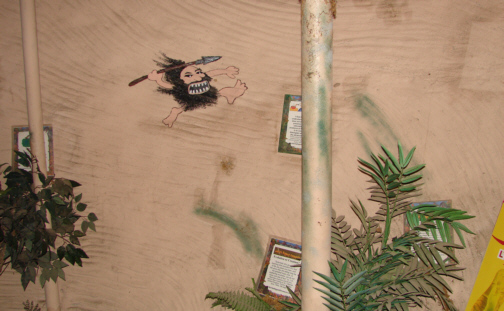 There were also some mock cave paintings like the cave man caricature seen in the photo below, however these may predate the creationist takeover of the attraction. 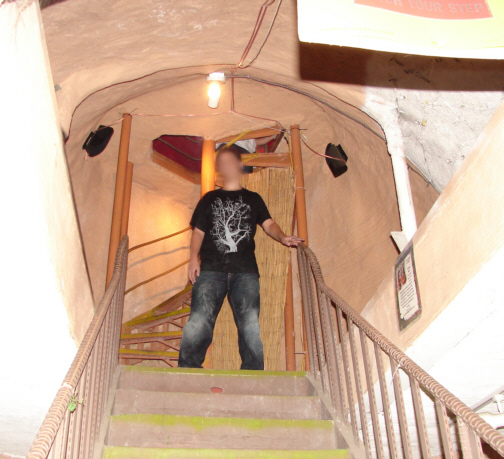 Below is the final flight of regular stairs leading to a small spiral staircase that takes you into Rex’s head. I’ve fuzzed out the face of this young man, who was waiting for family members to descend from Rex’s head, to protect his privacy. 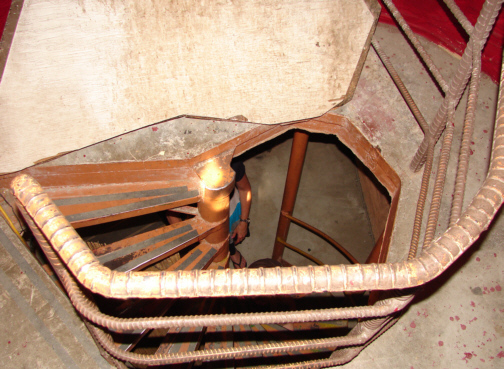 This photo is looking down the spiral staircase from the inside of Rex’s head. 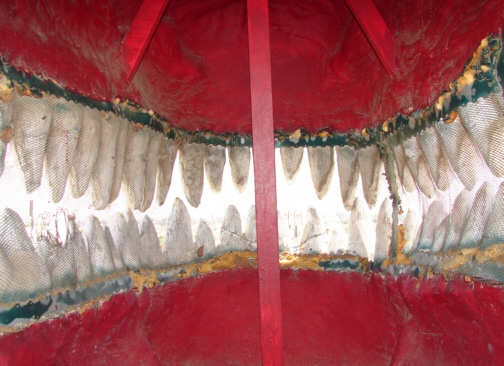 This is a view from the inside of Rex’s head, looking out through the teeth. 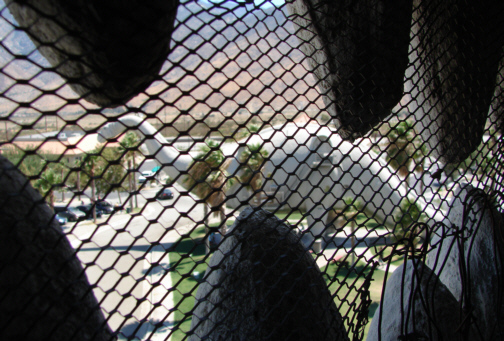 Here we have a shot taken through Rex’s teeth looking down and Dinny. After I was through exploring Rex’s innards, I walked back to the church turned gift shop at the entrance to the new addition. Within I found a mix of animated and static dinosaur models that like their outside counterparts were pretty much randomly distributed, however for reasons of space they are positioned cheek by jowl. 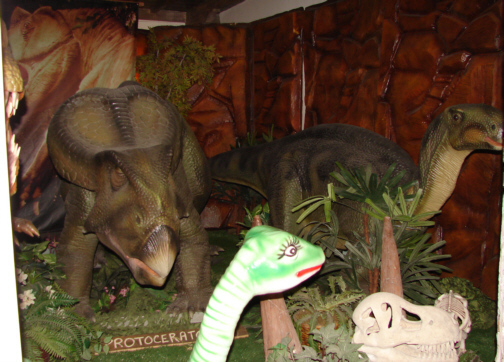 Off to one side of the shop is a diorama of sorts with several dinosaur models of varying quality. Another Protoceratops and some sort of hadrosaur. 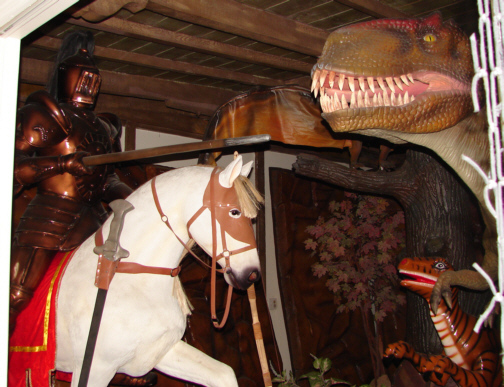 In my previous post on Dinny I showed a photo of a small diorama found inside the Dinny gift shop that showed group of medieval knights in armor fighting with a theropod dinosaur. This reflects the YEC belief that the legends of dragons were inspired by dinosaurs that survived into the Middle Ages. Below we find the same theme scaled up to life size, with an armored knight on horseback charging, lance in hand, at a theropod (Allosaurus?). Interestingly the small diorama that once appeared in Dinny is no longer there. 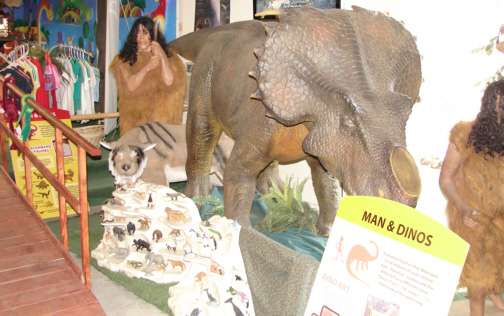 Continuing with the “humans coexisted with dinosaurs” meme, the opposite side of the shop had a pair of cave people and a Smilodon (saber-toothed cat) standing next to a ceratopsian and theropod dinosaur (outside of frame). 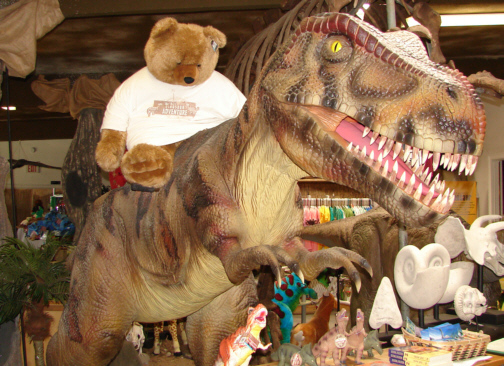 end the style portion of this report with the above image of a cuddly teddy-bear straddling a ferocious looking theropod. Isn’t that cute? If you want to see more of the “style”, check out these YouTube videos by Silverpsycho78. Two young women (one of whom I believe is “Silverpsycho78”) walk through the whole attraction. 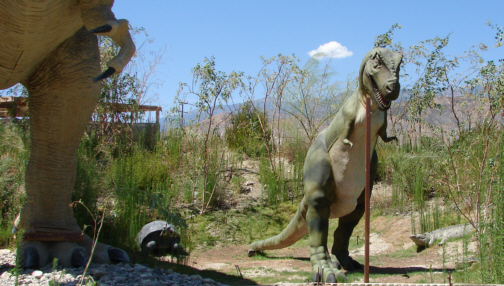 Now let’s take a look at some of the information propaganda the creationist owners have scattered around the attraction for the “edification” of their visitors (please note that this is not an exhaustive analysis, there were many other things to take issue with). 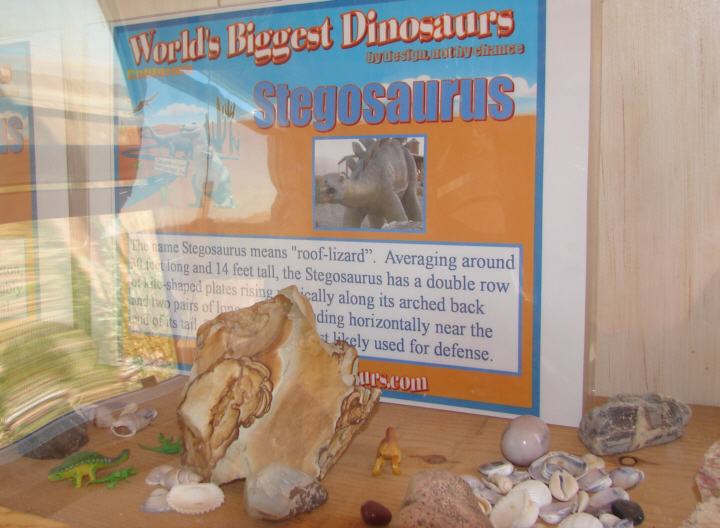 As with the dinosaur models the “information” signs and placards seemed to be more or less randomly distributed around the attraction. To begin with we have a version of the long running YEC delusion that the basal equid Eohippus, aka Hyracotherium (depending on who you talk to and which specimen you’re talking about), is identical or “almost identical” to the living Hyrax (Family Procaviidae). I don’t know why it is but creationists seem to be obsessed with kicking Hyracotherium out of the horse family tree. I guess it’s just because it is the first in the illustrations of horse evolution and they figure that eliminating this one stage will somehow make horses magically unrelated to other perissodactyls (tapirs and rhinos), mammals and vertebrates. 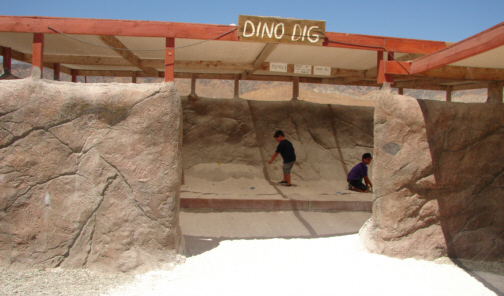 If you’re interested in this subject you might want to check out two of my previous posts on creationists and horse fossils, here and here. 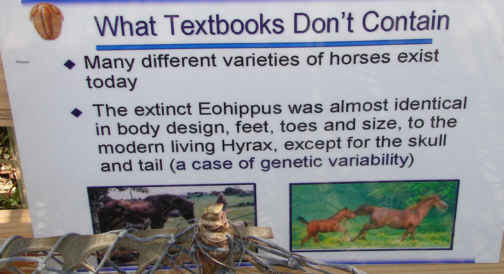 Bullet point 1) It is unclear what they mean by “varieties of horses”. They could be referring to different breeds of the domestic horse (Equus ferus caballus) or to the seven or so extant species belonging to the genus Equus (horses, asses, zebras, onagers). In either case textbooks most certainly do contain information on them. Bullet point 2) Amounts to some world class weaseling and denial. Weaseling because while it is true that Hyracotherium is generally similar to hyraxes the same could be said of many other small mammals (rabbits, small species of deer, foxes etc.). They are all mammals after all. But there are a number of finer details of anatomy that clearly distinguish them from hyraxes. Take a look at these two pictures; the first is a mounted cast of Hyracotherium and the second a hyrax (genus Procavia) skeleton. Even disregarding their heads for the moment, you can see that you don’t need to have a degree in comparative anatomy to note the overall similarity that marks them both as mammals and vertebrates or some of the small details that show that they are not of the same species. Compare for yourself the differences in the vertebrae (neck and backbones), the rib cage, and the proportions of the limbs. Again, even ignoring the glaring differences in the skulls these are not the same animal and no one who bothers to actually look at them would mistake this. Above is a species of mouse dear (Tragulus javanicus) for comparison; I have flipped the original picture around to facilitate this. The one particular similarity that Hyracotherium and hyraxes do share is their toes. Hyracotherium and hyraxes do share the same number of toes (4 on the forefoot, 3 on the hind foot), however hyraxes walk in a plantigrade manner with the sole of their foot touching the ground (all the time with their forefeet and part of the time with their hind feet) much like humans and bears. Below is a picture of the bottom of a hyrax’s hind foot, note that the foot pad extends all the way to the heel. Hyracotherium, on the other hand (or hoof), walked on their feet in a digitigrade manner, walking on their toes (which in life may have had tapir like pads). Later equids went even further walking in an unguligrade manner with just their hooves (the equivalent of our toe nails) touching the ground. A Hyracotherium skull from the mounted fossil specimen at the Los Angeles County Natural History Museum (photo by Don Frack). A skull of a living hyrax (Procavia), from a mounted skeleton at the Smithsonian Natural History Museum (photo by Don Frack). The mandible (lower jaw) is different, the nasal bones is obviously different, the whole cranium is different, and most significantly the teeth are almost entirely different, with a different dental formula (again see this post). If these creationists can cavalierly dismiss the differences in the skulls of these two organisms as merely “a case of genetic variability” then they should have no problem with accepting the same for the differences between, say, australopithecines and modern humans. At least australopithecines, humans and indeed old world monkeys, all share the same dental formula. Hyracotherium was not a hyrax or even all that similar and that would seem be more than sufficient reason for textbooks not saying otherwise. Next, there where several placards on “carbon dating” (a.k.a. radiocarbon dating) which YEC seem to be obsessed with criticizing in the context of the age of the Earth and of various fossils. What is odd about this is that carbon 14 (14C), or radiocarbon, dating is really primarily used by archeologists to date objects (wood or bone) that are around 60,000 years or younger and never by geologist or paleontologists who use other radiometric dating techniques to date the age of the Earth or fossils (or rather igneous rock layers adjacent to sedimentary layers containing fossils). And while I am by no means an expert in radiometric dating I could spot several problems with what they had posted and with a little research I uncovered even more. Right off the bat there is the problem that this placard suggests the use of radiocarbon dating to determine the age of fossils. This simply isn’t the case. Radiocarbon dating is only used on wood (or other plant material) or bone of land dwelling organisms that is un-mineralized (not fossilized). For example the ammonite fossil pictured in the upper right hand of the placard is disqualified on the grounds that it is a marine organism even if the original material of the shell had not been chemically altered by fossilization. 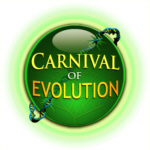 The carbon dated snail is a creationist standard and can be traced back to papers written by scientists working to eliminate sources of error in their dating techniques. In the original paper (Keith & Anderson, 1963) it was noted that aquatic snails will give anomalous carbon 14 dates due to the fact that the carbon used to make their shells originated from “old” carbon in the water they live in rather than atmospheric carbon which is the basis of carbon 14 dating. The same goes for such things as seals and penguins (other mis-dated animals often cited by creationists). This is known as the reservoir effect and is well understood. 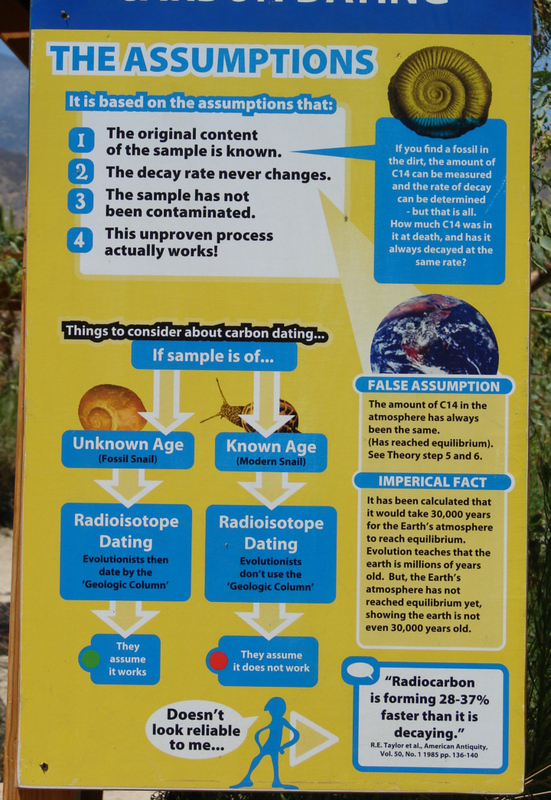 Of course the fact that scientists have explored this and other possible sources of erroneous dates gives lie to the implication (made repeatedly in the sign) that scientists make numerous untested assumptions when using carbon dating. The truth is there are countless volumes filled with scientific papers discussing possible sources of error, ways to test the premises upon which dating techniques are based. There is even a journal—Radiocarbon—dedicated to radiocarbon dating that was started in 1959. The common creationist caricature of scientists as a bunch of bumbling fools, who make all sorts of wild untested assumptions and who disregard evidence contrary to their desired conclusions, is a strawman that bears a much closer resemblance to creationists’ modus operandi than to the behavior of actual scientists. This sign is one bit of silliness after another. I replied (9-5-00): But you didn’t answer my question about whether what was said about you *dating* rocks was true or false. It’s obvious that you worked on lunar samples, but you didn’t date them, did you? I replied: All do not agree; this is a gross overgeneralization. Most disagree heartily with you. Some certainly would say that some dates may indicate the time of metamorphism rather than formation. Dawson replied: NASA stopped promoting the idea of 4 billion years because of the dating measurements on the Genesis rock (see webpage) — the answers were inconsistent. From the NASA website. last night regarding the Genesis Rock: “anorthosite”, “almost entirely composed of plagioclase”, “about 4 billion years old” but “a norite sample…is about 4.5 billion years old, virtually as old as the moon itself.” The rock is difficult to date because it is *not* composed of several minerals. The maria basalts date consistently to 3.2-3.9 billion years old, and some of the plutonic stuff to 4-4.5 billion years. Some rocks have had their clocks reset by later impacts, and would thus give younger dates. If you have contrary information or evidence of fraud, I suggest you go public. I replied: You really never said what you did. I hope you can clear this up. AND I NEVER HEARD FROM JP DAWSON AGAIN! After reading this I did a little searching on the web for this Dawson fellow and found he runs the Aaron C Ministries website which has several pages arguing for creationism (I’m shocked!). 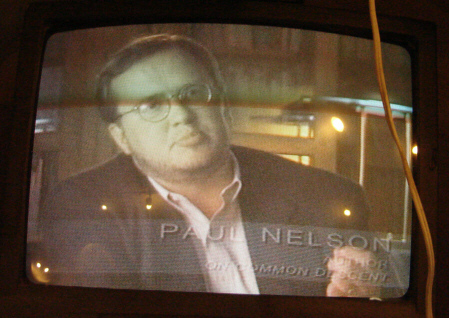 Apparently he did work for NASA at one point as there are references to him on official NASA web pages and according to his resume he was “responsible for the design, fabrication and operation of the scientific equipment for measuring the reflectance, emissivity, thermal conductivity, spectral reflectance and thermal properties of the Lunar Samples”. However there is nothing there to indicate that he was involved in the dating of the Moon rocks and it is clear that he doesn’t know anything about radiocarbon dating, otherwise he wouldn’t (as he seems to do on his site) suggest that this method was used on the Moon rocks. Studies of Genesis Rock indicate an age of about 4 billion years. However, it is believed that this represents a time when the rock experienced a metamorphic alteration and that the rock is actually older than 4 billion years. The stuff on the geologic column is standard creation boilerplate and therefore gibberish. The basic rules stratigraphy, such as the law of superposition, were worked out in the late 18th and early 19th centuries, as was the observation that there is a faunal succession in the fossil record. This led to the development in the early to mid-19th century of the geologic column; all done within the creationist paradigm and almost entirely by devout Christian geologists, many of them ordained ministers. The development of the geologic column allowed paleontologists to “date” fossil assemblages relative to other assemblages. That is, you can tell which types fossils are older or younger using the column, however there are no absolute dates inherent in the column. Nor is any assumption of actual biological descent relationships between the fossils inherent in the column. The explanation for faunal succession in general and the existence of intermediate fossil forms came later with Darwin and the theory of evolution. Likewise the absolute dates now attached to the various subsections of the geologic column came about later with discovery of radioactivity and the ultimate development of radiometric dating methods. That the relative dates of the geologic column and the absolute dates of radiometric dating, correlate so closely is one bits of consilience that gives us confidence that our understanding of the age of the Earth, and the history of life on it, are on the right track. The argument that the entire geologic column is not found in any one place is specious, as the column was only ever intended as an idealized model of the Earth’s stratigraphic history. It’s sort of like arguing that the periodic table is invalid because one never finds all the elements lined up in columns and rows. 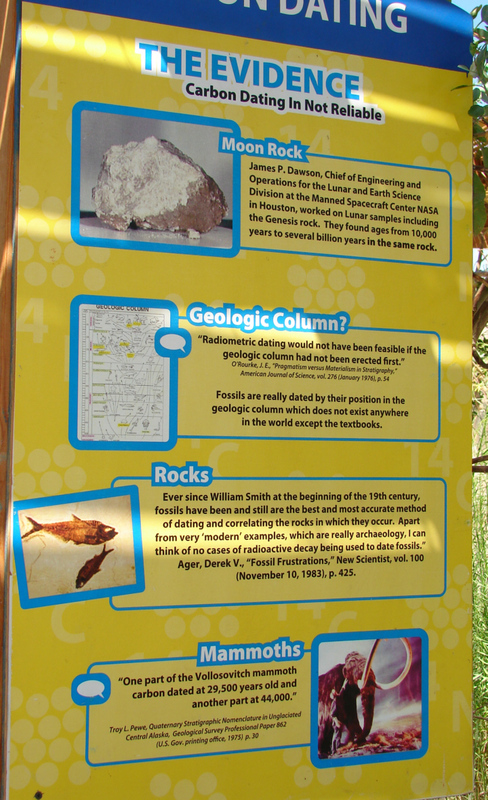 That being said it turns out that it isn’t even true that one cannot fine the entire geologic column in one place. There are many places where one can find representative strata from every geologic time period in the column stacked up one atop the other. Geologist Glenn Morton lists them here. Hovind makes a big-time misrepresentation here. I looked at the data in USGS Professional Paper 862. It is a 1975 paper by Troy Pewe entitled “Quaternary Stratigraphic Nomenclature in Unglaciated Central Alaska”. It is a description of stratigraphic units in Alaska, but does contain more than 150 radiocarbon dates. Many of these dates are from the 1950’s and 60’s. There are three references to mammoths: hair from a mammoth skull (found by Geist in 1951 in frozen silt); “flesh from lower leg, Mammuthus primigenius” (found by Osborne in 1940, 26 m below the surface); and the “skin and flesh of Mammuthus primigenius [baby mammoth] (found by Geist in 1948 “with a beaver dam”). The dates given are, respectively, 32,700; 15,380; and 21,300 years BP BUT the last is thought to be an invalid date because the hide was soaked in glycerin. NOWHERE IN THE PAPER DOES IT SAY, OR EVEN IMPLY, THAT THESE SPECIMENS ARE PARTS OF THE SAME ANIMAL. They were found in different places, at different times, by different people. One is even termed “baby”, and the other is not. To construct this Fractured Fairy Tale, Hovind must have hoped that no one listening would check and see what his reference really said. The incomplete reference given: “Encyclopedia of Dinosaurs, 2002” doesn’t seem to exist; at least I couldn’t find a book by that specific title from that year. There is an “Encyclopedia of Dinosaurs“, edited by paleontologists Philip Currie and Kevin Padian, but it is from 1997 and predates the discovery of the genera listed; Microraptor, Sinornithosaurus and Caudipteryx. However since none of these genera are problematic in anyway, let alone considered to be fraudulent, I highly doubt there is any reputable source that could be cited to support what is implied by this sign. 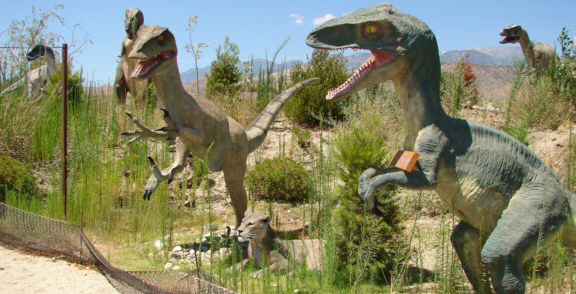 Now it is true that there was one case of “feathered deception” on the part of a Chinese fossil dealer who passed off a fraudulent fossil in the infamous “Archaeoraptor” incident. 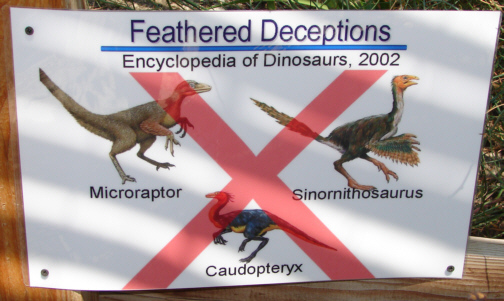 In that instance three legitimate partial fossil skeletons were combined into a single illegitimate one, and one of the legitimate fossils used in the fraud was the tail of a Microraptor. However this in no way calls into question the legitimacy of Microraptor as it is known from multiple specimens unrelated to the Archaeoraptor chimera. And of course, adding the insult to injury, they’ve misspelled Caudipteryx. However using this misspelling I was able to trace this sign to creationist slide presentations found in several places on the internet. After going through the slide presentation I found that indeed several of the signs posted in the attraction —including the one on Eohippus we’ve already covered—seem to have originated there. They literally just printed the slides onto paper and stuck them up. None of these creatures were found. They are deceptive and only in the minds of people who believe evolution so much that the real evidence does not matter. Now that is an example of weapons grade projection on display right there. 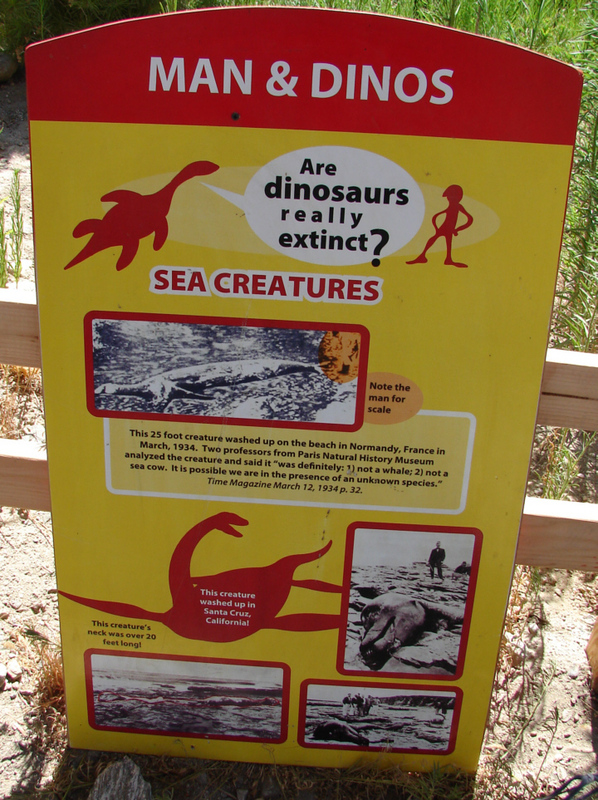 Setting aside for the moment that the prehistoric reptiles shown on the sign in red silhouette are plesiosaurs (marine reptiles), that while contemporaneous with dinosaurs were not dinosaurs themselves, the two claimed examples of supposed “dinosaur” sightings shown do not stand up to even the slightest scrutiny. At last two professors from Paris’ Natural History Museum arrived at Querqueville to settle the matter. Gravely they poked & peered. When they departed, carrying the creature’s head and tail for comparison with museum specimens, their minds were made up. The monster was definitely: 1) not a whale; 2) not a sea cow. Placed back in context we find that this a prime example of creationist quote mining. In this case not only taking what was said out of context but actually stitched two parts together to create a Frankenquote altering what was actually said. The truth we find is that the French scientists were not totally flummoxed by the carcass and that in fact one of the them specifically stated that in his opinion the carcass belonged to some sort of shark, suggesting only that it may be a species that was previously undescribed. Next we have the three photographs on the bottom of the sign which are of the “Moore’s Beach monster” (a.k.a. the Santa Cruz monster), which was found a little north of Santa Cruz, California, in 1925. I’ve seen these pictures before on creationist and cryptozoology sites and was never particularly impressed by them. When I first saw them my immediate thought was that they were of a dead cetacean of some kind. To me the head clearly looked like it might be some sort of dolphin. As it turns out Darren Naish author of the wonderful blog Tetrapod Zoology has written a couple of times on the Moore’s Beach monster, and his investigation confirmed that my first guess was just about right. The carcass belonged to a Baird’s beaked whale (Berardius bairdii ). That this is the case is not base only on the photographic evidence but also on the fact that the skull of the Moore’s Beach monster was collected and currently resides in the collection of the California Academy of Sciences. So much for sea monsters. However on another sign headlined “How many hominid fossils are there?”, they inform us that while it is a “common belief” that there are only a handful of hominid fossils, there were in fact, already “approximately four thousand specimens” unearthed by the mid-1970’s and many more have been found since that time, but that numbers of fossils aren’t really important, rather it is how we interpret them. So which is it? 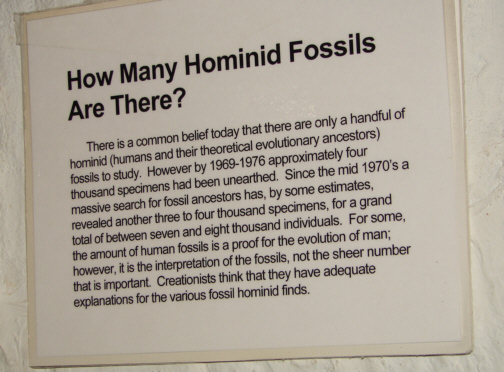 Are there hardly any hominid fossils, with all of them able to fit on a dinner table or are there many thousands of them and numbers aren’t even important? Another bit of self contradiction also involves human origins; however this time it involves a particular specimen, “Java Man” which is the type specimen for Homo erectus. 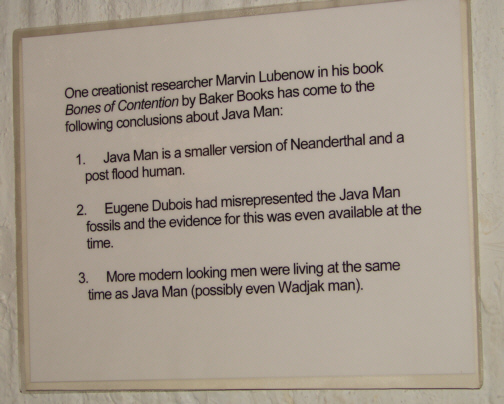 On another they inform us that “creationist researcher” Marvin Lubenow has concluded that Java Man was “a smaller version of Neanderthal and a post flood human”. 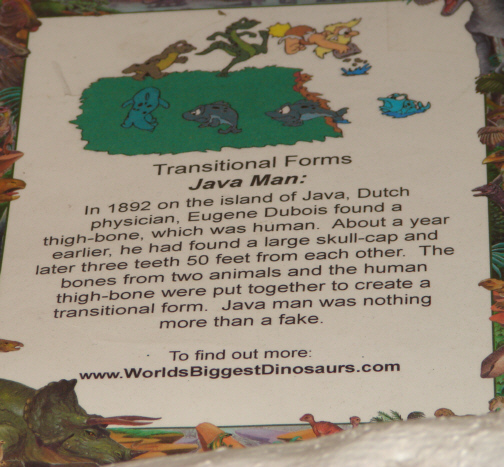 So is Java Man “nothing more than a fake” or just a “post flood human”? Inquiring mind want to know. After all this “high quality science” it was no surprise that when I went inside Dinny to see if any changes had been made they had a video presentation running of one of the Discovery Institute’s Center for the Renewal of Science and Culture “documentaries” explaining some of the supposed flaws in evolutionary theory. All I can say is, the program fit right in at the attraction. Perhaps, hopefully, one day Dinny and Rex will be free of their benighted owners but for now they remain hostages to this sad display of ignorance and look to remain so for the foreseeable future. I’m sure I’ll an opportunity to check in on them again in another year or two. Keith, M. L., and G. M. Anderson (1963) “Radiocarbon dating: Fictitious results with mollusk shells” Science 141: 634-637. This entry was posted in Antievolution, Creationism, Defending evolution, Evolution, Geology, Intelligent design, Paleoanthropology, Paleontology, Personal, Pseudoscience, Systematics, Zoology and tagged Americana, Apollo 15, Archaeoraptor, Baird's beaked whale, Berardius bairdii, Cabazon, carbon 14, carbon dated mammoth, carbon dated snail, Caudipteryx, Cherbourg carcass, Creationism, cryptozoology, Dinny, dinosaurs, Eohippus, Genesis rock, geologic column, hominids, Homo erectus, Hyracotherium, hyrax, Java Man, Microraptor, Moon rocks, Moore's Beach monster, Paul Nelson, radiocarbon dating, radiometric dating, Rex, Sinornithosaurus. Bookmark the permalink. British professor Nigel Swiggerton of Chapsworth College has recently found a missing link in the evolution/creation debate. Everyone is familiar with the “stages of man” chart found in textbooks which begins with a naked, hairy, bent over, grunting Neanderthal type which over millions of years finally learns how to stand erect while sporting a 1930s-style haircut. Well, Dr. Swiggerton discovered that someone accidentally reversed the negative. 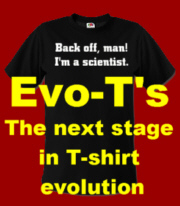 It turns out that the first man was actually standing erect with a short haircut but has been descending over the years until he has finally reached the last stage – the stage at any rock concert filled with naked, hairy, bent over, grunting Neanderthal types! “Hairy and grunting”? Why, I resemble that remark! I think they’re referring to Malam/Parker’s “Encyclopedia of Dinosaurs and Other Prehistoric Creatures” ( http://www.amazon.com/Encyclopedia-Dinosaurs-Other-Prehistoric-Creatures/dp/1405409444 ). I know at least 1 of those illustrations is from said book. Thanks, I will have to keep an eye out for that book. No problem. Just don’t spend money on it. It’s not creationist bad, but still pretty bad. The Ghostfishe reviews in the Amazon link explain why.